This article is about the city. For the Orsinium DLC pack, see Orsinium (DLC). 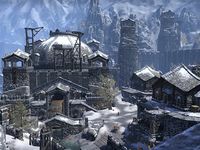 Orsinium is the largest city in Wrothgar, and the home of King Kurog. Completing quests and objectives in Wrothgar will contribute to rebuilding the city, returning it to its former glory. 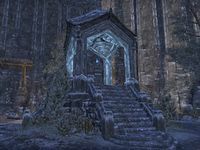 The Orsinium Wayshrine can be found in the southern quarter of the city. The Letter from the Orsinium Orphanage and New Life Charity Writs mention donors for the Orsinium Home for Displaced Children, though it cannot be found in the city. The book Return to Orsinium, released long before the DLC, mentions many locations such as the Caves of Dark Abundance, the Everember Forges, and the Malacath-worshiping Temple of Grievance that do not appear in the city. Some were likely early names for locations that do appear in the city. It also mentions the Jugular as being the river that runs through the city, and the Obdurate Gates as the gate entrances. This page was last modified on 15 December 2018, at 18:28.